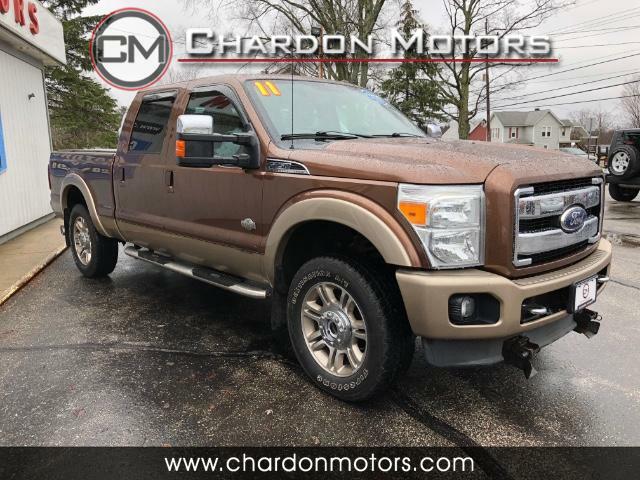 2011 Ford F-250 Super Duty Crew Cab King Ranch Offered by Chardon Motors. This is a CARFAX CERTIFIED vehicle. 6.7L Diesel. Incredible truck! Extremely well-maintained King Ranch. Inside and outside are way above average. You can tell this one was pampered in the garage! The finish is smooth and bright. No evidence of being a smoker's vehicle either. Options include leather heated and cooled driver and passenger seat, chrome package, step bars, factory moonroof, 110V outlet, Microsoft Sync, power heated folding and extending mirrors, backup camera, step tailgate, navigation, CD player, auto climate control, full power accessories, aux input, usb input, bluetooth, and much more. Western plow mount too! A very fresh Western 8ft Pro Plow is available for an additional cost. Advertised price is for truck and plow mount that is on the truck.